Vladimir Filippovich Tributs (Russian: Влади́мир Фили́ппович Три́буц) (July 28 [O.S. July 15] 1900 – August 30, 1977) was a Soviet naval commander and admiral from 1943. Born in 1900 in Saint Petersburg, Tributs joined the Navy in 1918 and during the Russian Civil War participated in combat actions on the Volga and in the Caspian. He graduated and received his commission from M.V. Frunze Higher Naval School in 1926 and graduated from the Naval Academy in 1932. From 1932 to 1936 he served on ships of the Baltic Fleet (the battleships Parizhskaya Kommuna and Marat) and commanded the destroyer Yakov Sverdlov. 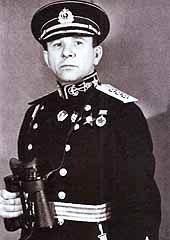 From February 1938 to April 1939 Tributs served as the Chief of Staff of the Baltic Fleet and from April 1939 to 1947 he commanded it. As war approached, Tributs observed the growing evidence of hostile German activity with apprehension; in the summer of 1940, he "advanced Baltic Fleet headquarters from its historic seat at the Kronstadt fortress in Leningrad to the port of Tallinn, two hundred miles to the west" despite his worries about security problems and the difficulty of constructing a new base. On June 19 he put the Baltic Fleet up to "Readiness No. 2" state, which meant fueling the ships and putting their crews on alert, and late on the evening of June 21 (the eve of the German invasion) he moved to "Readiness No. 1" state, which was fully operational. On August 17, the defense of Leningrad was placed in his hands. From March 1946 until May 1947 he commanded the 8th Fleet (Baltic Fleet). On May 28, 1947 he was made Deputy Chief of the troops of the Far East for the Navy. In June 1948, was recalled to Moscow. In September 1948 - January 1949 - The head of the military and naval schools and senior naval officer in Leningrad. In March, 1949 - December 1951 - Head of the Hydrographic Department of the Navy of the USSR. In June and September 1948 and January–March 1949 remained at the disposal of the Commander in Chief. The Udaloy-class destroyer Admiral Tributs is named after him. ^ Harrison E. Salisbury, The 900 Days: The Siege Of Leningrad (Da Capo Press, 2003: ISBN 0-306-81298-3), p. 16. ^ Salisbury, The 900 Days, p. 224. The Baltic Sea Campaigns were conducted by Axis and Allied naval forces in the Baltic Sea, its coastal regions, and the Gulf of Finland during World War II. After early fighting between Polish and German forces, the main combatants were Germany and Finland, opposed by the Soviet Union. Sweden's navy and merchant fleet played important roles, and the British Royal Navy planned Operation Catherine for the control of the Baltic Sea and its exit choke point into the North Sea. While operations included surface and sub-surface combat, aerial combat, amphibious landings, and support of large-scale ground fighting, the most significant feature of Baltic Sea operations was the scale and size of mine warfare, particularly in the Gulf of Finland. The warring parties laid over 60,000 naval mines and anti-sweep obstacles, making the shallow Gulf of Finland one of the most densely mined waters in the world. Destruction battalions, colloquially istrebitels (истребители, "destroyers", "exterminators") abbreviated: istrebki (Russian), strybki (Ukrainian) were paramilitary units under the control of NKVD in the western Soviet Union, which performed tasks of internal security on the Eastern Front and after it. After the Fall of the Soviet Union the battalions were deemed to be a criminal organisation by Estonian government. SS Eestirand (Estonian Coast), built in 1910, was an Estonian steel-hulled cargo steamship. She was one of the largest ships in her class at the time and served as the mother-ship of the first Estonian herring expeditions in the 1930s. In World War II she served as a Soviet Navy transport vessel and was subsequently sunk in 1941 near Prangli Island during the Soviet evacuation of Tallinn. The Gulf of Riga campaign was fought by the Soviet Navy against the Kriegsmarine during Operation Barbarossa in 1941. The Russian Hydrographic Service, full current official name Department of Navigation and Oceanography of the Ministry of Defence of the Russian Federation (Russian: Управление навигации и океанографии Министерства обороны Российской Федерации), is Russia's hydrographic office, with responsibility to facilitate navigation, performing hydrographic surveys and publishing nautical charts. Since the Russian state is of such a vast size and nature that it includes many different seas, long and indented coastlines and a great number of islands, as well as a complex system of waterways and lakes, surveying has been an indispensable activity for the Russian Navy since its modernization at the time of Czar Peter the Great in the 17th century. The hydrographic service has been historically attached to the Russian Navy and the agents and supervisors of hydrographic works have been largely naval officers throughout its history. Russia is a member of the International Hydrographic Organization. The Soviet evacuation of Tallinn, also called Tallinn disaster or Russian Dunkirk, was a Soviet operation to evacuate the 190 ships of the Baltic Fleet, units of the Red Army, and pro-Soviet civilians from the fleet's encircled main base of Tallinn in Soviet-occupied Estonia during August 1941.Soviet forces had occupied Estonia in June 1940. After the German invasion of the Soviet Union began on 22 June 1941, German forces advanced rapidly through the Soviet-occupied Baltic states, and by the end of August the Estonian capital of Tallinn was surrounded by German forces, while a large part of the Red Banner Baltic Fleet was bottled up in Tallinn harbour. Yevgeny Alexandrovich Nikonov (Russian: Евге́ний Алекса́ндрович Ни́конов; 18 December 1920 – 19 August 1941, in Harku, Estonia) was a Russian war hero martyred during the Soviet defense of Estonia in 1941. He is a holder of the Hero of the Soviet Union, the Soviet Union's highest award.